Where do you go when you've got a great idea for a website or an app? Will a web design company take it on? Will the idea be successful? How much will it cost? How do I adequately pitch the concept to professional web agency who can, in turn, market the result to target audiences? 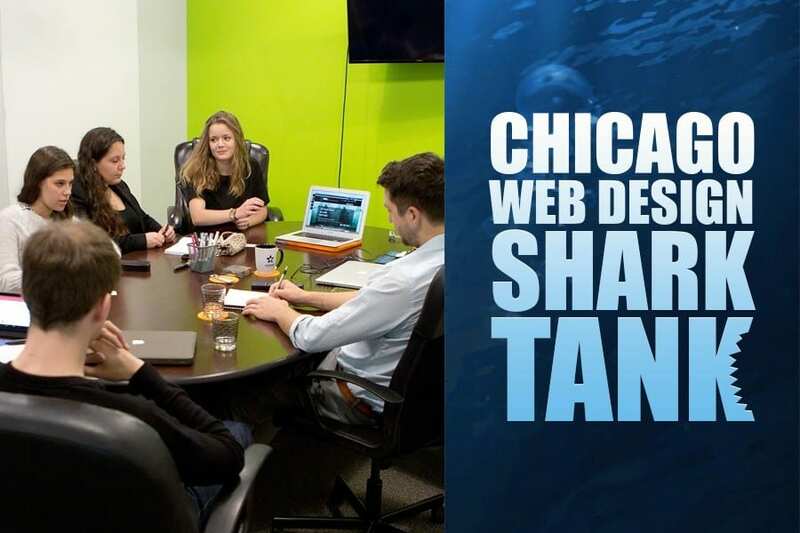 You could apply to ABC's hit TV show, “Shark Tank”....or, you can visit the talented team at Comrade Web, the Chicago Web Design Agency! A classroom of students at Harrington College of Design were recently submerged in Comrade’s ‘Shark Tank’ to get professional, straight-talk feedback to their ideas. These young adults, aged 21-24, met with “the Comrades” – and were honored to take part in a pro bono event sponsored by our Chicago web development company. Initially approached by one of the College’s professors, Ivan, our CEO, agreed to share our team’s expertise. The full class arrived at our office with Professor Michael Quintos in the early afternoon last Friday. After a heated game of foosball (essential equipment for any web design company worth its salt), they began presenting their brilliant ideas. Available soon on a digital device near you? Interestingly, even though their ideas began as solutions to a classroom assignment that is a necessary prerequisite for graduation, each team rapidly moved beyond doing their work “just for the grade.” Instead, we could clearly see the time, energy and passion they had poured into conceptualizing solutions for interesting real-world challenges. In fact, the Comrade team’s hope is that the students continue shaping their concepts to leverage current technology in such a way that their projects can get fully designed, developed and launched online. As a next step, we recommend their honing presentation items to a higher degree of accuracy, supported by research and embellished with design, such that Angel Investors and Venture Capitalists will consider funding development with real money. 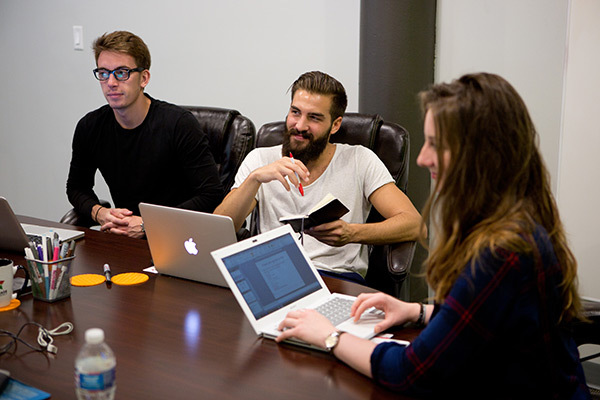 Armed with great ideas, PowerPoint presentations, Comrade Web Agency’s pricing models and the right attitudes, these Millennials can easily emerge as the next generation of entrepreneurs. Every generation changes and reshapes the world around them. It’s their turn, now! Chum for sharks or top of the food chain? 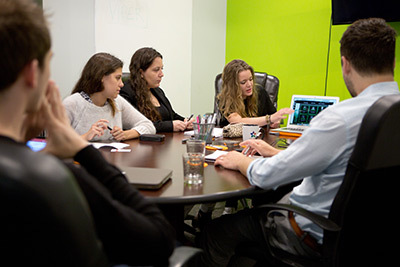 Without divulging details, we were amazed at the diversity of issues tackled. The first group saw an opportunity to ‘match’ people on a social level using sports and geographic proximity. The second team determined a need for a social networking platform with a unique twist that distinctly separates it from the pack of facebook, twitter, instagram and linkedin. The third pair of students turned the tables on their own University experience and created a collaborative tool concept that bridges the current gap among educational institutions, students and industry; while the fourth team blended shared purchasing tools across the spectrum of a mobile-friendly website and iOs/android apps. We enjoyed each group’s unique take on technology that solves everyday problems. Admittedly most students were interested in web design pricing as it related to their concepts. Although impressed with the range of problem-solving offered, our panel of professionals maintained poker faces and asked some hard-hitting questions. The students were given individual feedback, a few strategies regarding effective marketing mix presentation skills and some general questions to ponder moving forward. We are Comrade Web Agency, and we’re open for business – whether you’re a Fortune 500 company or a couple of aspiring students at Chicago’s Harrington College of Design.